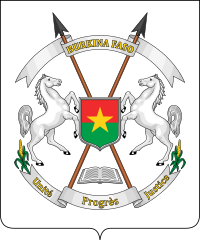 A ribbon bearing the legend "BURKINA FASO"
Per fess gules and vert, a mullet Or. Crossed spears behind the shield. Àmì ọ̀pá àṣẹ ilẹ̀ Bùrkínà Fasò je ti orile-ede Burkina Faso.